My son loves this movie! GREATEST MOVIE OF ALL TIME!!!!! This movie has been my favorite since I was like 4 or 5 years old and I just turned 21. it is most definitely shelf-worthy. The Chipmunk Adventure is truly the greatest adventure ever! I loved this movie as a kid and have enjoyed the faces of my 6 and 2 year old as they watch it! It's a great "flick!" I'd Give This Movie 100 Stars If I Could!!!! If kids don't have this movie or have never seen it, they've NO idea what they're missing!!!! This is by far my all-time fave movie in the world! I've watched it so many times I can practically recite half the movie almost word-for-word & I can say the lines with each character while watching the movie, without looking up! Huge Chipmunk fan here, if you couldn't tell already. I may not own everything that has to do with them, but I do have quite a bit. If I'd more money I would so buy every single item on here that I don't have. But, alas, I have to wait patiently for when I do have the money & am not spending it on Ninja Turtle things - my other all-time fave cartoon. But, yes, this movie is Awesome! The best ever! Kids MUST see this movie!!! I know kids who've never seen the cartoon, yet love this movie anyway thanks to me! *grins* Though, I SWEAR parts of it have been cut out. I got it on VHS back on my 17th birthday in 2001. There's part of the movie that got cut out, but I can't prove it, because somebody taped over the original version I had - thus the bad thing about taping stuff on blank tapes off television. I just wish I could find the original version in the original casing & watch it & prove that there ARE parts of the movie missing - All Chipette parts too! Like when they crash the balloon after the hurricane - Brittany says something about having to blow dry her hair that morning, that's why they can't use it to get the balloon back up & running again. And then when they return the penguin - the baby penguin hugs Eleanor again when they're all in the balloon about to leave the lil' guy behind & Eleanor is supposed to tel him, "No, you better stay here with your Momma." I think there's another part missing too, but I can't think of it at the moment. Well, enough of my rambling & thanks for listening! cartoony. The lack of the warmer colors diminish the original quailty of the film. I waited along time only to be disappointed. For a first time viewer this movie will still have alot of charm and you and your kids will love it. I give the original version a 5 STAR rating. The DVD only a 3. I will be looking to buy a vhs version with the original art work and magic that I enjoyed prior to remastering. I LOVED this movie as a child. I rented it every time I went to the movie store until my parents started telling me no. I was so excited to find it and even more excited to find that I like it just as much now. I would reccommend this movie to anyone who was a Chipmuncks fan and even people who just loved 80s cartoons. In my opinion, the best part of the movie is the "sing off" between the chipmuncks and chipettes. The song came back to me in no time. This is a film I've loved ever since I was a child, and even bought the VHS on Amazon a couple of years ago back when the dvd wasn't available. The dvd version of this film has a few errors in it, such as the fact that several scenes were mysteriously 'cut' -- such as is the case where the Chipets are kidnapped in Cairo and taken into the palace of a young prince, where a segment has been cut-out when the prince is talking to the girls. This also happens twice again when the Chipmunks are in Fiji -- once when a small segment is cut while the boys are around the camp fire, and then again later in the village. This happened a couple other times around the film, along with the fact that some poor transitioning/fade effects were added into the dvd version of the movie between scene changes so that scenes would 'fade together'. Apart from all that, though, it's still a wonderful "5 star" film on its on. "The Chipmunk Adventure" has a great plot, and music that's just as great! I think it's a film people of all ages can enjoy, and definitely worth an 'animated classic' title. This is truly a good find. The animation has great style and crisp scenes. The sound quality is great also, with optional surround sound, and stereo. It does not sound stifled or old. This is a great family film! The Nostalgia Couldn't Be Stronger!!! this movie was great. it was so funny the First time I watched it when I was younger on VHS and now on DVD. is It just me or are there some parts missing maybe not ! but anyways I think everyone can enjoy this movie young or old. I think my favorite parts are as follow .... when Simon tells Alvin to land the balloon by the fountain in Mexico City, but it crashes into a tree instead) "Like I said, in the tree." "Hugs and Kisses," I had the same problem on my DVD: Most of the background dialogue and sound effects were missing. For example, in the beginning when Miss Miller is calling for Dave when she first arrives, you can't hear her yelling when Dave and the chipmunks are reacting to her from upstairs. In the arcade, you can't hear the Chipmunks cheering at the machine right before Claudia yells, "Noisy brats!" Then, when Dave calls Miss Miller, you can't hear the phone ring, but yet she goes to pick it up anyway. And you can't hear Alvin talk about how much he loves Athens right before Simon says, "Alvin, you've never been to Athens." And when the natives capture them, and Alvin shows them the clothes and radio, you can't hear them reacting in astonishment, and so on. I was really upset until I realized I have to adjust the audio options; the DVD is programmed to already start the movie with the 5.1 surround sound feature, but my TV doesn't have surround sound, as I'm sure most people's TVs don't. I clicked on the "stereo" option and skipped to the parts of the movie with the missing audio, and they were there again. In other words, if you had surround sound, you would be able to hear the phone ringing from the speaker behind you and Miss Miller calling from the side of the room, etc. As for the movie itself, this is possibly the greatest animated kids movie ever, including "The Little Mermaid" and "Beauty and the Beast" (it's certainly the most underrated). The only reason why I'm giving the DVD version 4 stars instead of 5 is because I was a little disappointed in the bonus features. There's only some screen caps of artwork, though apparently, you see some "deleted scenes," like when the Chipmunks are captured by a group of dogs who hold them in their mouths. But the DVD didn't even have the trailer! Oh well, it's better than nothing. I'm just glad this classic has been finally released. (Theodore tells him to get into the balloon as he's clinging to the side for dear life) "Why didn't I think of that?" (Alvin asks him if he knows how to operate the balloon) "Not a clue, Alvin!" (Simon tells Alvin to land the balloon by the fountain in Mexico City, but it crashes into a tree instead) "Like I said, in the tree." Thanks MP. I changed my audio to English Stero under the DVD Setup screen and I have backgroud audio and sound effects. I was also disappointed with the special features. I thought they would have music videos, making of the movie, deleted scenes or something. That is why I am leaving my rating at four stars. However, I still love it, love it, love it. I remember seeing this movie for the first time while visiting my cousins in New England in the 80's. Loved it then, love it now. I even brought my niece a copy. I have a copy on VHS from when I tape it off the Disney Channel, before they started showing commericals. Need to say it is a bit worn; therefore, I was excited when it was being released on DVD. Originally released in 1987, the story begins when David Seville, the chipmunks' guardian, goes off to Europe ona business trip, leaving the boys at home with a neighbor as a babysitter. Ever the schemer, Alvin dreams of world travel on his own, and seems more upset at being left at home than he is oer the departure of his "parent". Enter two sinister, "Euro-trash" international smugglers. A borther and sister pair, they need someone who can deliver 5 million dollars worth of diamonds to their customers overseas without arousing the suspicion of the authorities. the pair finds in the chipmunks and their girlfriends the perfect couriers, and arranges the diamonds to be delivered under the guise of a hot-air balloon race around the world with a one-million dollar prize at stake. The boys and their girlfriends enter the race, not realizing what they were getting themselves into. Meanwhile, the interpol authorities are tracking the boys, both with the intent of getting the kids home safely and catching the smugglers in the process. while the movie is largely tame by today's standards, parents should be aware that there are a few racial stereotypes depicted, for example, at a Mexican fiesta, almost all the people are wearing sombreros; in Egypt, the Arabs are decpicted as riding on camels. While harmless in the 80's, these images have deeper implications for today. Parents might wish to use these images to prompt discussion regarding international relations and stereotypes. Parents should also be aware that the female villain, Claudia furstein, smokes regularly and in one scene, sips a martini. But these detractors are mionor--for many young children in the 80's, this movie was their first exposure to famous world monuments, such as the canals of Venice, Machu Picchu and the pyramids. Although I had already traveled widely by the time I saw the movie, I still loved it. When I spent a year in Europe, one of the first places I went was to the PArthenon in Greece, the site of a mjor event in the movie. I have also gone to other locales that were featured in the movie, never once forgetting where I first saw them. AMAZING movie . . . what's with the cover art? The movie is, of course, a classic and there are applicable reviews on the original release . . . but . . . is this version any different? If there're any additional features, I'll double dip, otherwise, I'll stick with the original DVD release. I already have the soundtrack, so i don't need a "bonus CD"
Flashback of my childhood through my children's eyes! This is by far the coolest movie ever. Those chipmunks must be Italian. This is definitely a delight for children and adults. Personally, I cried when the baby penguin was returned to his parents. It moved me. The soundtrack is awesome too, but it would be more awesome if it included something like "O Sole Mio" or "Con Te Partiro." Or maybe some Justin Timberlake. If you never saw this movie as a child, you were severely deprived of the best childhood movie EVER MADE!! This movie completes me...well it completed my childhood and it is still a part of me. 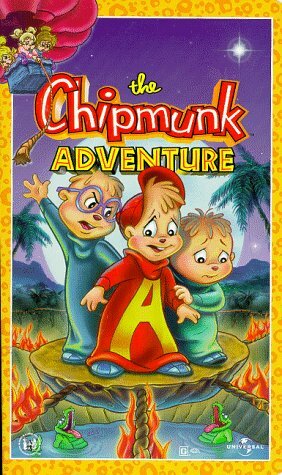 When the most recent Alvin and the Chipmunks movie came out I started reminiscing about my childhood and suddenly remembered about this movie. I watched it all the time as a child!! Everyone keeps referring to it as a series that kids from the 80s watched but I was born in 90 and watched the series and this movie all the time so the whole "Alvin and the Chipmunks 80s" thing is not necessarily true - kids from the 90s loved it..and, like me, still do! This is a great movie with great, upbeat songs, and I don't care what anybody says, I still love Alvin and the Chipmunks, as well as the Chippettes, and ALWAYS WILL!! They were a HUGE part of my childhood and I will never forget what fun they were. Sadly, the episodes from the television series I have not been able to find, but since this awesome movie is available I'll take it! It's probably the best Chipmunk movie ever made; some of the others aren't that great. The songs rock and the movie is just such a classic if you grew up with Alvin and the gang. Kids of today will not know this - it's not from their generation so don't try to give this to your kids - this is for all of us who grew up with the Chipmunks! This movie rocks; I'm gonna buy it right now!~!! Seriously, if you were a kid during the 80s-90s and don't remember this, buy it and watch it and you WILL! It totally was the best part of my childhood - it makes me want to turn back time and be a kid again. Plus, if you don't like singing Chipmunks, not only were you a weird kid, but you're probably still a freak - Alvin and his friends rock!!! Enjoy this DVD- I'm even kind of happily surprised it IS on DVD- SERIOUSLY! Get it now, before it goes out of print!!! ALVIN AND THE CHIPMUNKS ROCK!!! I really HATE go shopping out the crowd. I love this by going thru item which are cheaper than BEST BUY. I enjoyed ordering from you!